New Zealand Manuka Honey is a monofloral honey – that is, it is produced by bees that have visited predominantly one species of plant, such that the properties of the plant may give the honey distinct characteristics (such as flavour, fragrance). 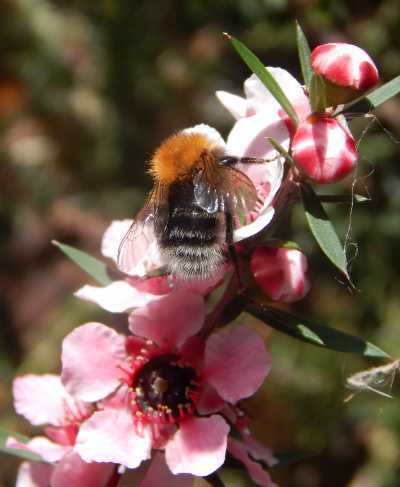 Bumblebees also love Leptospermum scoparium - this variety: 'Martini'. Commonly known as: Manuka or New Zealand tea tree, grows in our garden. Manuka honey is specifically produced by bees that only visit the manuka tree (Leptospermum scoparium) in New Zealand. 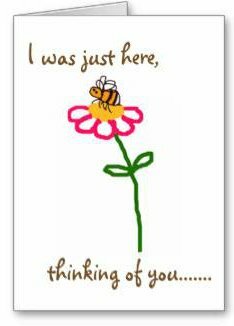 The bees that produce manuka honey are European honey bees (Apis mellifera) that were introduced into New Zealand. The manuka tree grows throughout New Zealand. However, it has also been introduced to other countries as an ornamental shrub. I live in the UK, and have a very beautiful Leptospermum scoparium (pictured above). It gets covered in bees from end of May onwards, and the flowers are delightful. It needs a sheltered spot - ours grows against the sunny wall of our house. We originally had two of these shrubs, but the other was planted in an exposed position, and didn't survive snowfall. However, the Tea Tree belongs to the genus 'Melaleuca' found in Australia, whereas the Manuka or New Zealand Tea Tree belongs to the genus 'Leptospermum'. 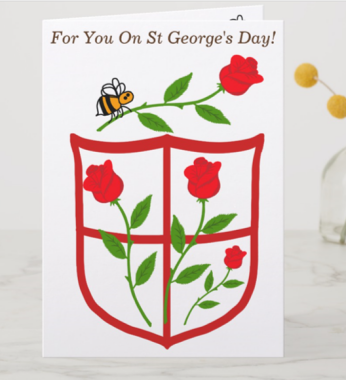 The flowers are popular with honey bees but also a range of bees, including solitary bees. Hoverflies are also regular visitors. What are the characteristics of Manuka honey? Manuka honey is a very viscous honey (that is, it seems to be very thick, and doesn’t flow easily) – and is probably the most viscous of all honeys. It has quite a dark colour – although it can vary from dark cream to dark brown. The taste is described as earthy or slightly bitter, while some people describe it as being herbaceous or aromatic. Is Manuka Honey different from other honey? There is evidence that manuka honey may be effective against MRSA. There is some evidence which could suggest that manuka honey may be effective in wound care in some circumstances (e.g. depending on bacteria type present within the wound). Manuka honey is sometimes proposed as a remedy for acne, but so far, I have seen no clear, convincing clinical evidence that has proven manuka honey's efficacy for this skin condition - it seems more research is needed in this area. There are three controversies surrounding manuka honey. The first controversy concerns the validity of the honey – is it genuinely manuka honey from New Zealand, or is it adulterated? 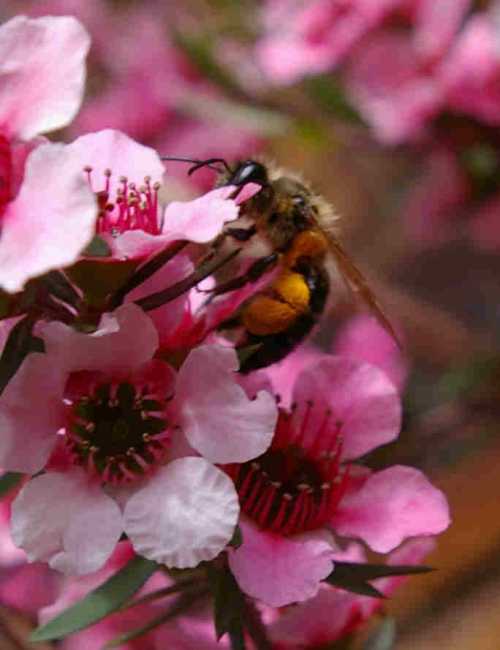 To be labelled as manuka honey, at least 70% of the pollen content must be from the L. scoparium tree, which exists predominantaly in New Zealand and so the New Zealand Manuka Honey production should represent almost all the world’s production. However it is interesting to note that the New Zealand Manuka Honey manufacturers trade association (Unique Manuka Factor Honey Association - UMFHA) states that about 1,300 tons of manuka honey are manufactured each year (2013 data), and yet about 10,000 tons of manuka honey is sold worldwide each year. In other words there is more Manuka Honey being sold than is actually being made! Sample testing by UMFHA in UK, China and Singapore has revealed that some Manuka Honey is adulterated with syrup (about half of the samples they tested in 2012 / 2013). It is not immediately clear how to tell when faced with a jar in a supermarket: whilst the colour can be seen, it is not possible to test the viscosity without purchasing a jar and opening it. Is Australian Manuka Honey the same as New Zealand Manuka Honey? The third controversy revolves around the possible medical benefits. Test tube studies (in vitro studies as they are called in medicine) have shown that manuka honey has an antimicrobial activity against a number of pathogenic bacteria and fungi. However, when clinical studies are done to test the effect of manuka honey on patients’ symptoms for some conditions (in vivo studies) the effects have been variable, or requiring more evidence before they could be used in a publicly accountable clinical setting, such as the UK NHS. It has been shown that, whereas the antimicrobial effect of non-manuka honey is due to a number of factors (including peroxide levels), with manuka honey it may be due to a component of the honey called methylglyoxate, although this has been disputed. But although manuka honey has shown significant activity in some studies (including against MRSA) clinical studies show mixed, though some promising results in wound healing and more evidence would be needed to support use in acne (what does exist, seems to suggest manuka may not be beneficial for this condition - please get in touch if you learn of any new or conclusive evidence either way). Certified, medical-grade manuka honeys are available from specialist websites, and Amazon.com has some available, with some excellent reviews. Note, you can get manuka honeys with a guaranteed level of MGO this one, for example, is highly rated but the benefits of more MGO may not be clear.